Thomas Kirk, a long-time farmer in Licking County, Ohio, was "accidentally killed" in December 1846, according to the 1879 obituary of his second wife. The circumstances behind my fifth-great grandfather's death remain a mystery. This single passing mention tantalizingly hints at an unexpected end. In search of clues about his death, I trawled through 1846 area newspapers during a recent trip to the Ohio History Connection in Columbus. Spotty surviving newspaper collections didn't yield the answers I sought. However, a couple advertisements did help shape my understanding of how the Kirk family's future would unfold. 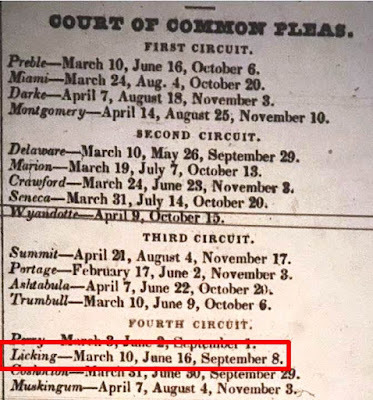 In a December 14, 1846 edition of The Ohio Press, published in Columbus, I came across an advertisement for the schedule of when the Court of Common Pleas would be held in each of Ohio's counties. 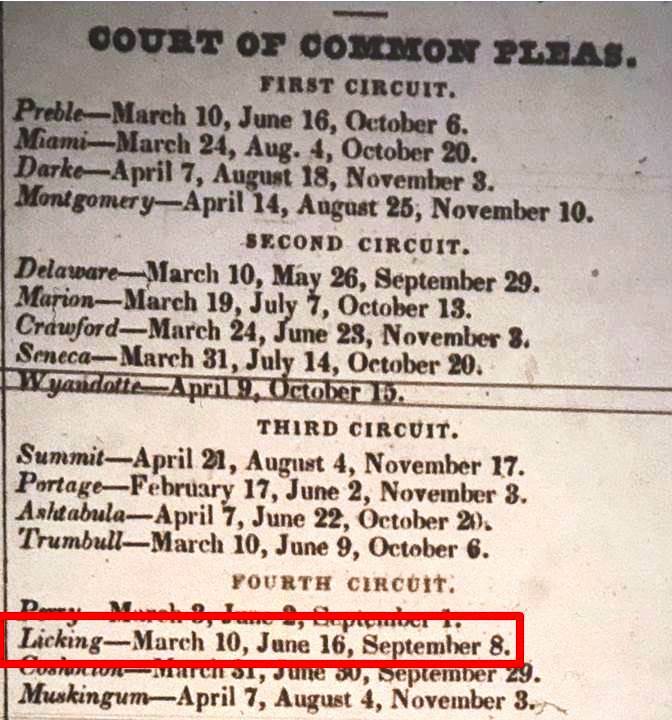 In 1847, the court would next be in Licking County on March 10th. Sure enough, the two surviving records from Thomas' probate package were dated March 1847. Thomas' death seemed to have been a pivotal moment for the Kirk family. In the years after the settlement of his estate, his children pulled anchor and migrated westward to Illinois. What was the draw? 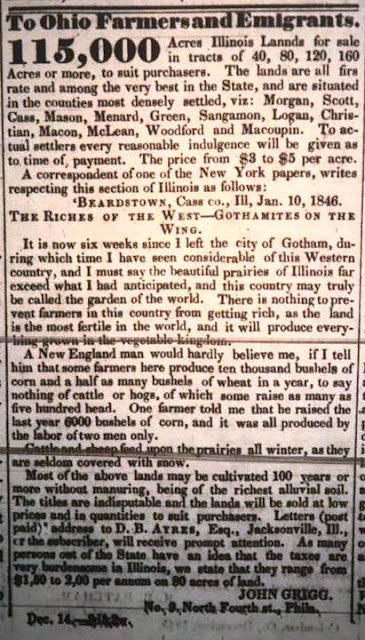 Another advertisement in the same December 1846 newspaper shed light on their possible motivation. 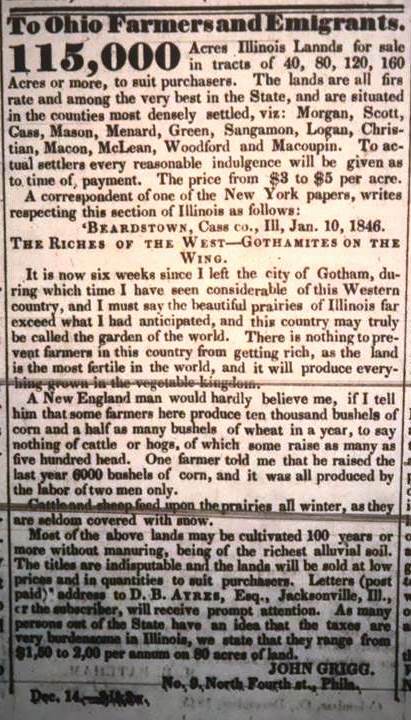 Land tracts in Illinois were being promoted to "Ohio farmers and emigrants." According to the advertisement, "the beautiful prairies of Illinois far exceed what I had anticipated, and this country may truly be called the garden of the world." How does anyone turn that down? If beauty wasn't enough, it also helped that, "There is nothing to prevent farmers in this country from getting rich, as the land is the most fertile in the world, and it will produce everything grown in the vegetable kingdom." What farmer could say no to that? Seven of Thomas Kirk's children took the bait and settled in Crawford County, Illinois. The first two were his son Joseph Kirk and daughter Jane Kirk. Joseph and Jane were married to siblings from the same family, Eunice Tracy and Lloyd Tracy. Bertha Wood Rhodes, a descendant of Thomas, wrote a short family history in 1968 that indicated this first move occurred in the spring of 1846 when Thomas was still alive. "After the marriage of Joseph Kirk and Eunice Tracy plans were made to leave Licking County and go west to Illinois. In the spring of 1846 wagons were packed and Lloyd Tracy and family, and his brother Elijah and family, with Joseph and Eunice Kirk...left their homes in Ohio and traveled slowly westward to their new homes." This journey to Illinois was also documented in a biography of George Tracy, son of Lloyd and Jane (Kirk) Tracy. "Lloyd Tracy and his brother, Elijah Tracy, brought their families from Licking County, Ohio, to Crawford County, Ill., in 1846, making the trip in wagons..."
When the 1850 census was enumerated, two more of Thomas' children were living in Crawford County, including his daughter Rachel and son Hugh. Thomas' son William Kirk followed shortly afterwards. William's 1888 Crawford County, Illinois obituary suggested he arrived in the 1840s: "He could be regarded as one of the pioneers of the county, moving from Ohio and locating here over 40 years ago." However, the 1893 obituary of William's widow, Nancy Anna (Swisher) Kirk, stated, "In 1851 she with her husband and family moved to this county and located on a farm some five miles northwest of this place [Robinson, Crawford County] which has ever since been her home." A biography of David Kirk, son of William and Nancy Anna, reiterated the 1851 arrival: "The family emigrated to Illinois, and on September 1, 1851, settled in Crawford County, purchasing 600 acres of land which were subsequently developed." The move date was corroborated by the 1850 census, which enumerated William and his family still in Licking County. The 1906 Crawford County obituary for Kezia (Patterson) Kirk, the widow of Thomas' son James, noted that she and her husband, "came to this county from Janesville [Zanesville? ], Ohio, in the fall of 1852, living on the farm where she died." Thomas' son Greenberry Dorsa Kirk was the last to move and join his siblings, which he did in time to appear on the 1855 Illinois state census. There's more behind these moves than just newspapers advertising verdant land that produced abundant cash crops. Following Thomas' death and subsequent estate settlement, his heirs inherited his land - about 16.5 acres each. Each sold their share of the property. The funds likely enabled them to make a new life for themselves in Crawford County where land was readily available and more affordable. My next steps are to track down Crawford County land records and tax enumerations to officially pinpoint the arrival of the Kirk children.